I know I said I wasn't going to do simple updates anymore but this is my blog so don't tell me how to run it. I have, indeed, returned back from the land-of-which-many-things-are-blocked (i.e., mainland China) and I have a hard-drive brimming full of photos (sixty four gigabytes of images and videos! ), a head packed with stories, memories, and experiences, but alas, no time. And so, I have not been given the sweet opportunity to edit many of the photos (let alone go through them) and upload many. However, this image will have to suffice for now. It was early in the morning and the sun had just come out from behind the mountains. The water looks deceivingly warm due to the 'steam' emerging from the surface, but alas, the temperatures were literally freezing. Scientific explanation for the 'mist' is uncertain. 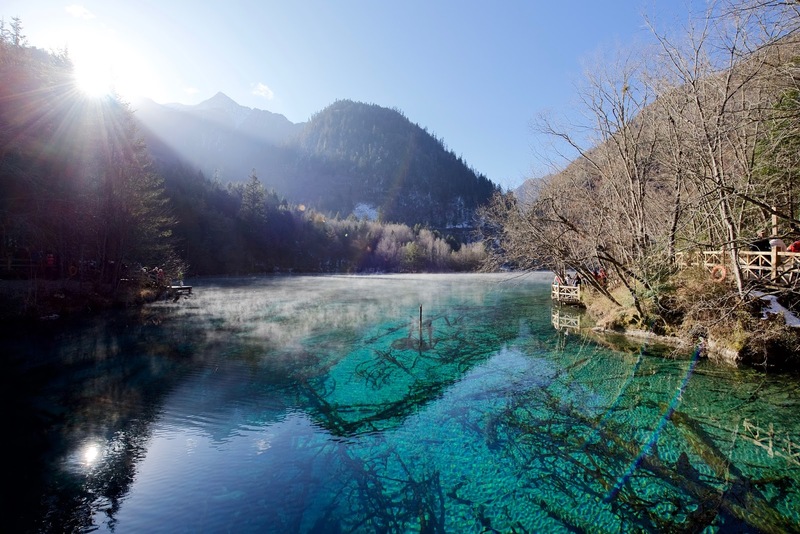 Needless to say, Jiuzhaigou （九寨沟）is absolutely gorgeous and I know the image looks fake as an artificial prosthetic, yes indeed, the water was actually that colour. I kid you not. To this day I still wonder how such a natural and untouched body of water can possess such vibrant and brilliant colours. Some may say 'Mother Nature is an artist', or perhaps some may say 'The Creator has an endless imagination full of beauty', or perhaps some may say 'It's probably the minerals and salts dissolved in the body of water'. Either way, it's currently past my bed-time and I have many things that must take priority over taking photos and commenting on my holiday. Though, I will admit I did learn very much on this trip, about culture (Tibetan culture is very interesting) and also about myself (This was a trip away from home that I really, really needed to have -- now I believe I have myself sorted... At least a bit more before I left!). Many thoughts and dwellings on things such as culture, religion, economic development, industrialism, environmental protection, family, relationships (both friends and romantic)... Just to name a few. However, now is not the time to talk about them, but perhaps later. I hope you have all had a stellar start to the New Year (speaking of 'stellar', I have also been reading Cosmos by Carl Sagan and can I just say, it is a book worth reading. More on this another time.) 2015 has brought us all a lot, and I wish you all the best in 2016, which is bound to have its ups and downs. May you be healthy, mostly happy, and also hydrated sufficiently.